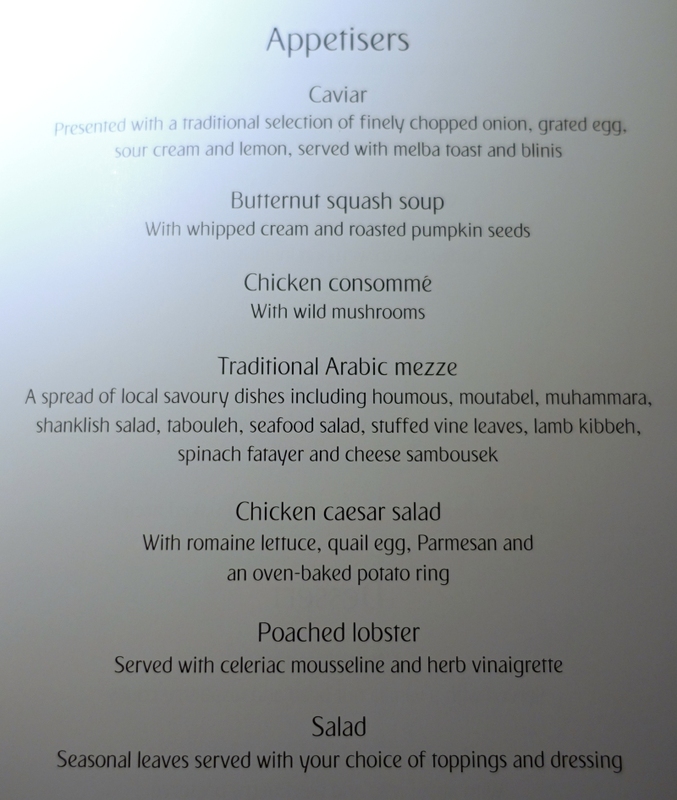 This Emirates First Class A380 Review on a JFK to Dubai flight is part of a trip report on the Maldives. 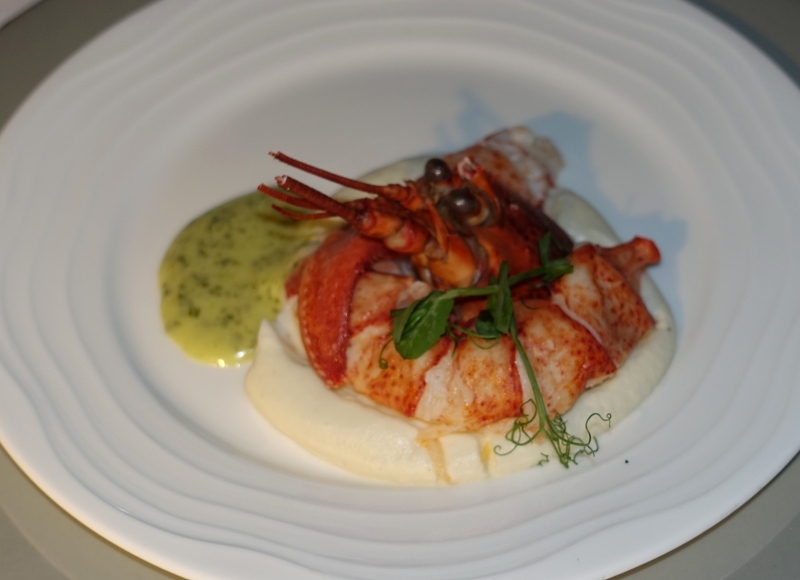 For the prior post, please see my Emirates Lounge, JFK Airport Review. 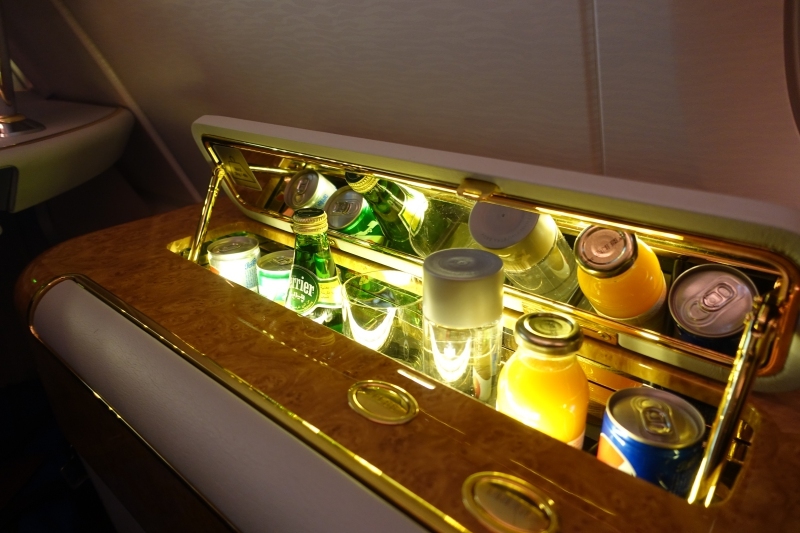 The Emirates First Class Cabin on the A380 offers 14 enclosed suites in a 1-2-1 configuration, on the upper deck. 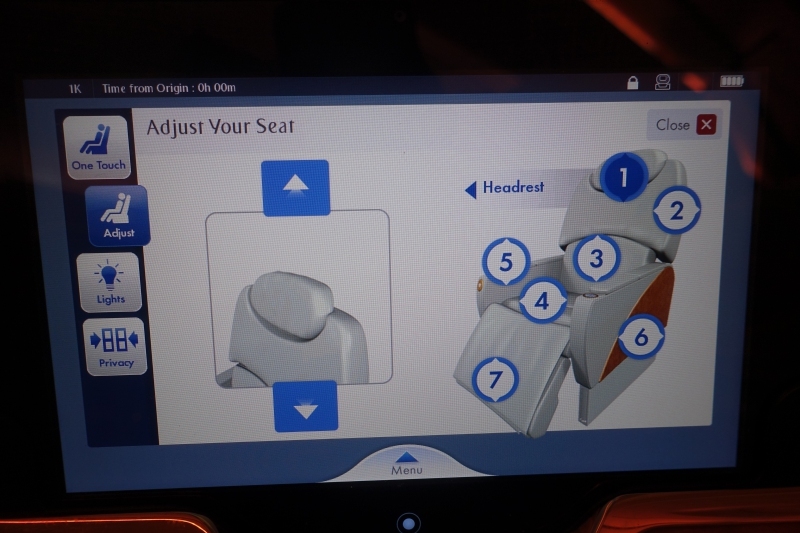 Since there are lavatories in the front (one on each side) I generally recommend avoiding the first row, even though I did take 1K as one of our seats, to see how it was, and it was fine actually. 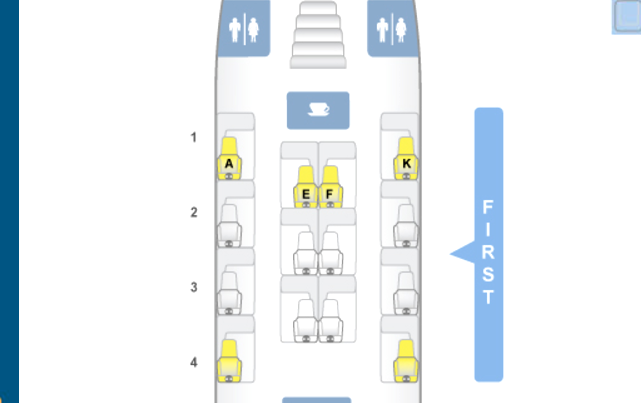 I'd still recommend avoiding the last row seats of 4A and 4K, since these are near the galley where the food is prepared, and flight crew tend to be busy and sometimes talking with each other in this area. 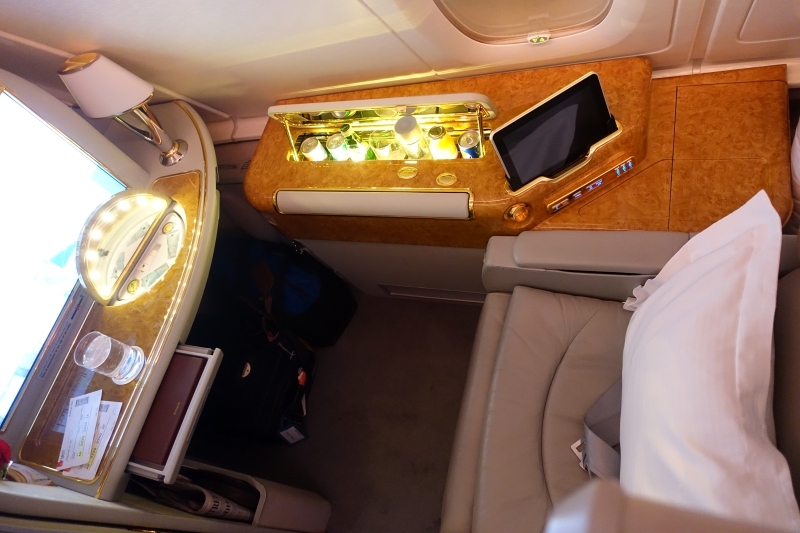 The Emirates First Class seat is 23 inches across, which is narrower than many other first class products; for example, JAL First Class seats are 33 inches across, Asiana First Class on the A380 is 25.2 inches across, Singapore Suite seats are 35 inches across, Lufthansa First Class seats are 31 inches across and Cathay Pacific First Class seats are 36 inches across. 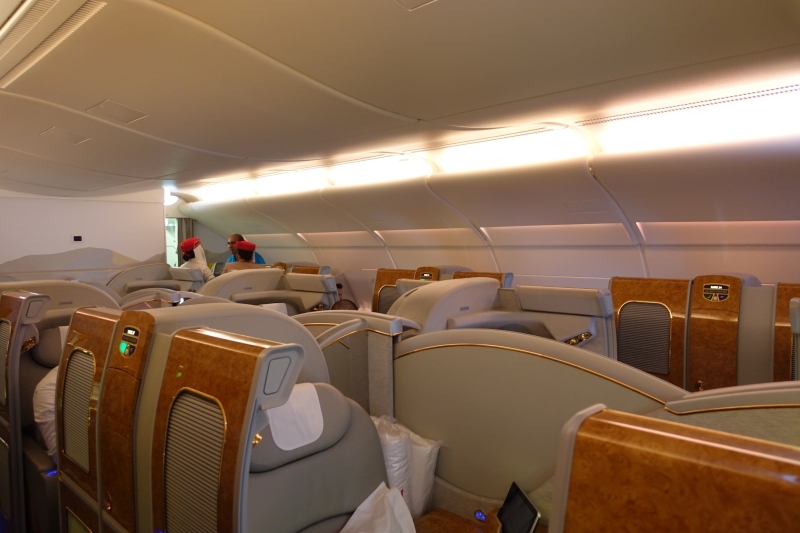 But if the seats are narrower than typical for first class, you do get closing suite doors and the bling factor. 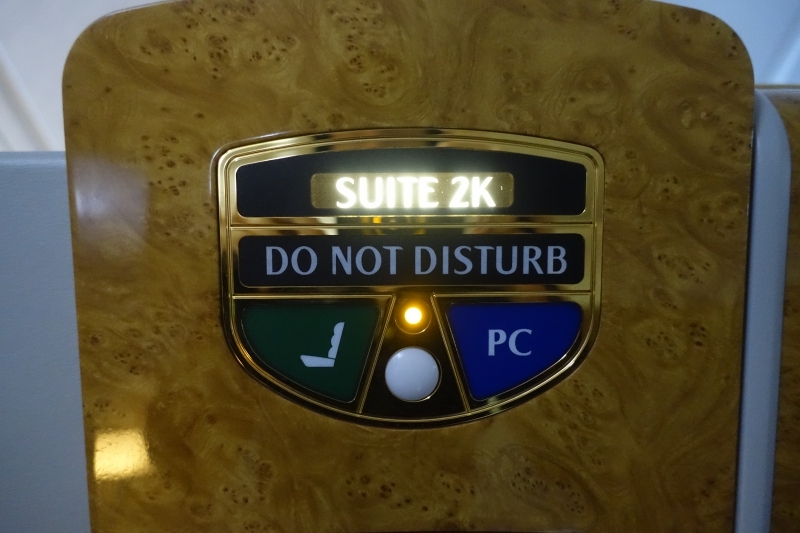 So if you're a fan of Trump hotels or St. Regis decor, you'll feel right at home, given all the gold trim and the lighted mirrors. 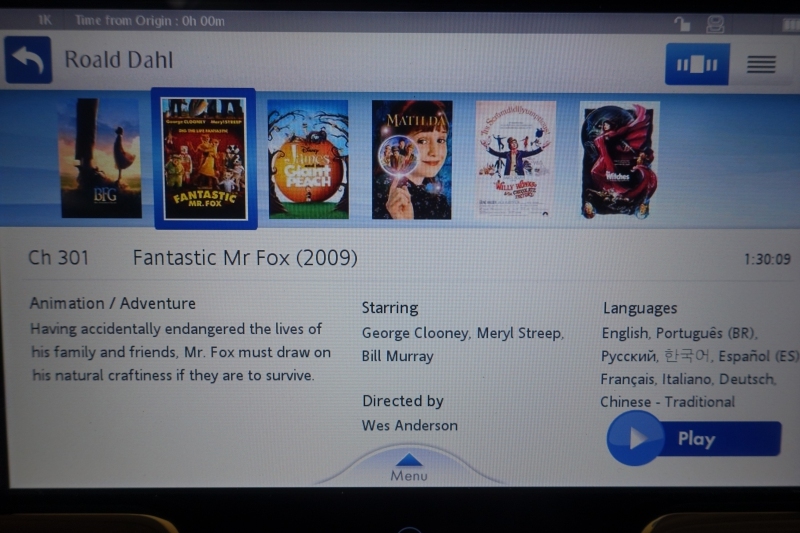 The touchscreen seat and lighting controls, on an iPad-like device, worked for about half the flight for me before becoming unresponsive, but eventually one of the flight crew was able to reset it for me. 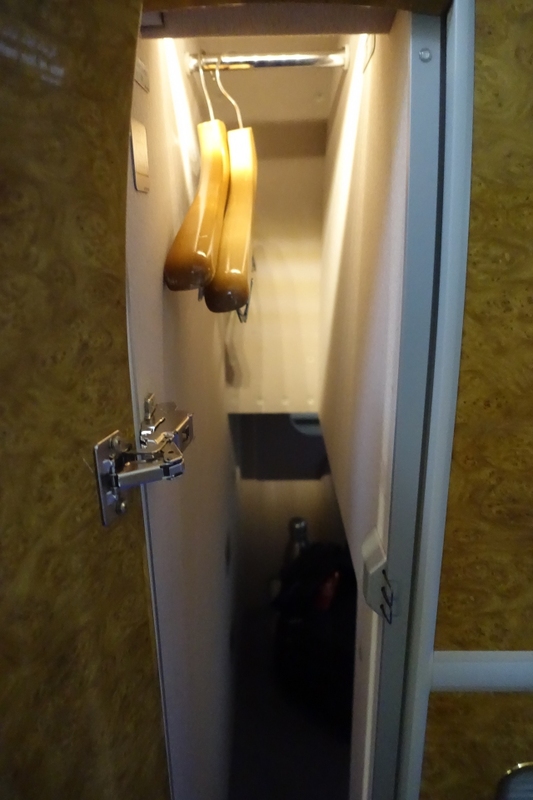 And there's also a storage closet with hangers for your coat or suit. 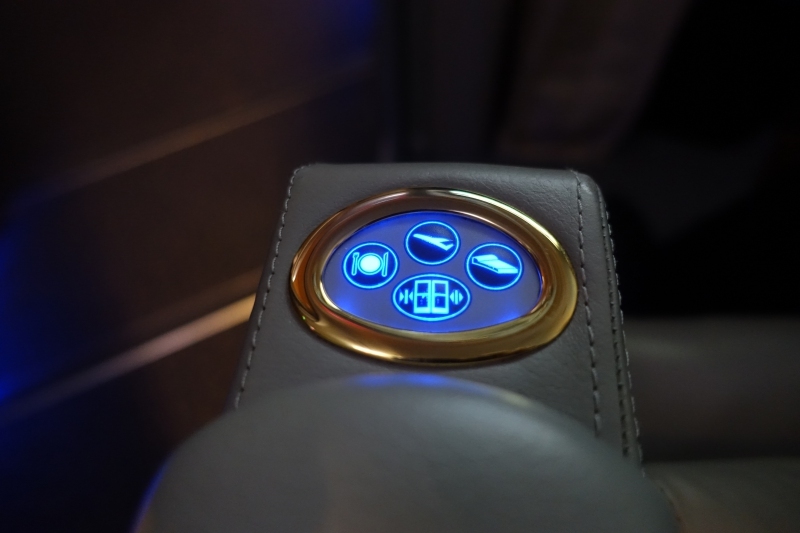 I like that the power outlet is prominently placed within your line of vision, as part of the table under the IFE screen, so there's no awkward hunting around under one of your arm rests or the lower part of your seat to find it. 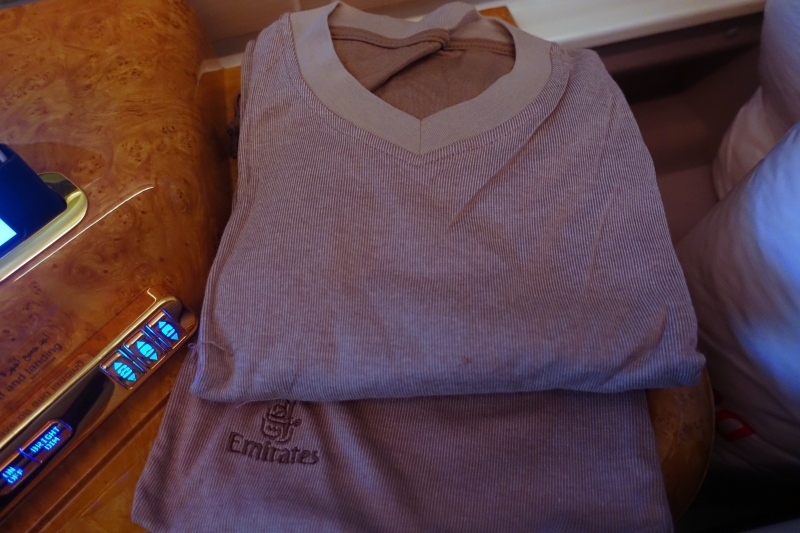 After boarding and before take-off, we were presented with Emirates First Class pajamas, which are fairly thin but soft and comfortable. 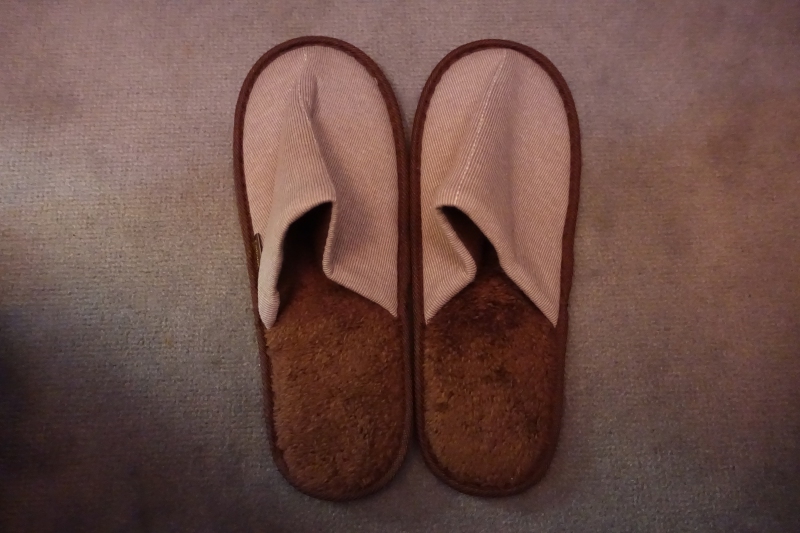 They are clearly pajamas and not stylish the way Etihad First Class women's pajamas are, but they have become my husband's favorite pajamas (also because the XL men's size actually fit his 6'5 frame, which isn't always the case). 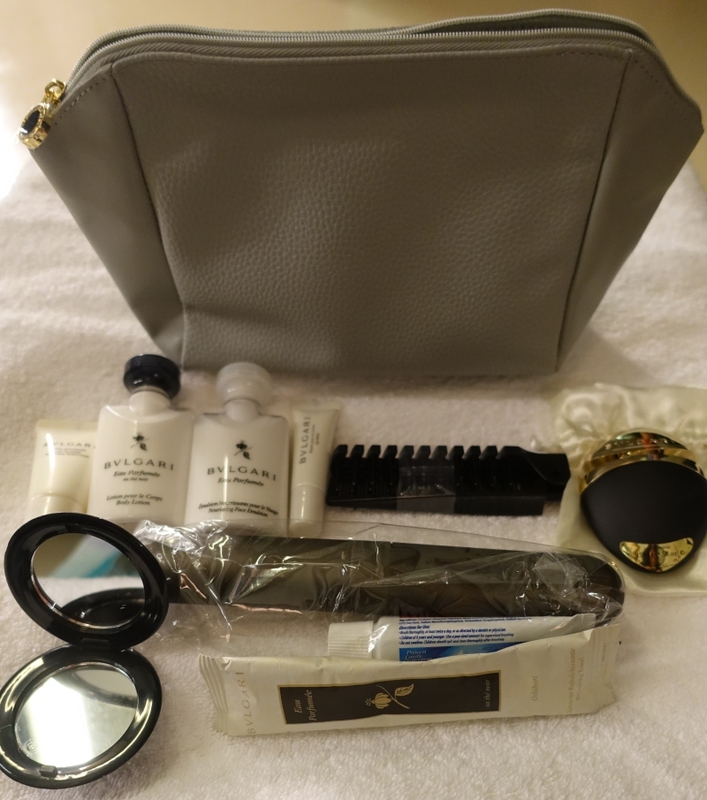 The women's amenity kit bag is grey, similar to the Emirates First Class seats, and contains a nice assortment of Bulgari bath products: body moisturizer, hand moisturizer, lip balm, dental kit, perfumed towel, a mirror compact, etc. 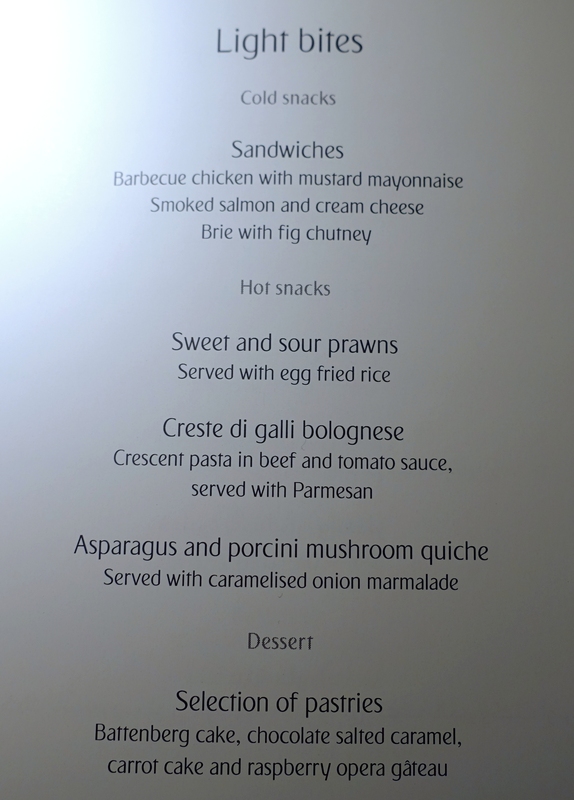 While one of my early Emirates First Class trips in Asia left me underwhelmed with the food, I was very happy with my food on this flight. 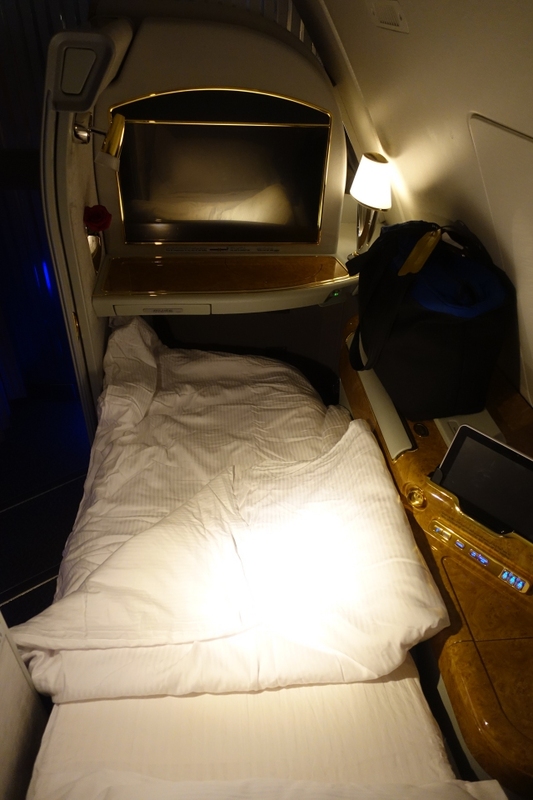 Since it was so late, nearly midnight, by the time we were at cruising altitude, I went to sleep and didn't haven any food right away, even declining the welcome dates and Arabic coffee, as well as the snack basket that is provided before take-off and again at cruising altitude. I have to say though, that the basket now contains much better choices than Mars bars and Lays potato chips–there was a small box of Valrhona chocolates, a Brookfarm macadamia nut and cranberry granola bar from Australia, some dried mango, and other snacks. 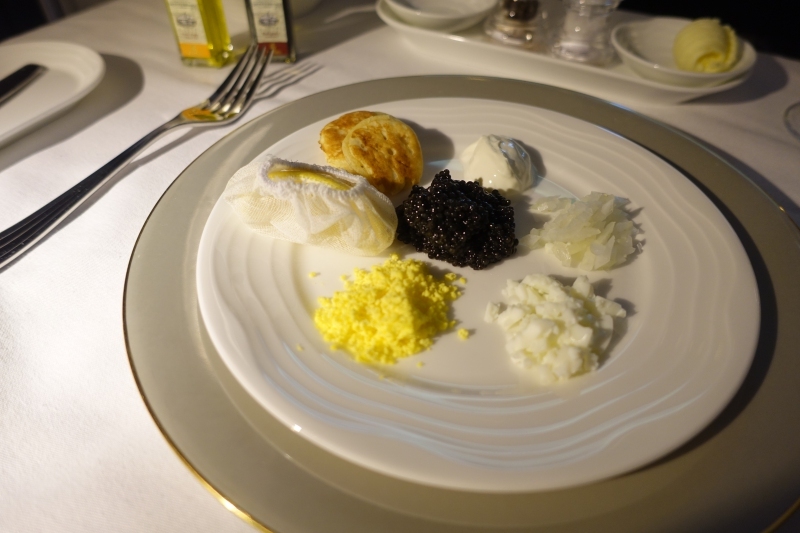 I asked to have some caviar saved for me for later in the flight, and while it's not Calvisius caviar served in its own jar as in Cathay Pacific First Class, it was still tasty and served with all the accompaniments: chopped egg yolk, chopped egg white, sour cream and blini. 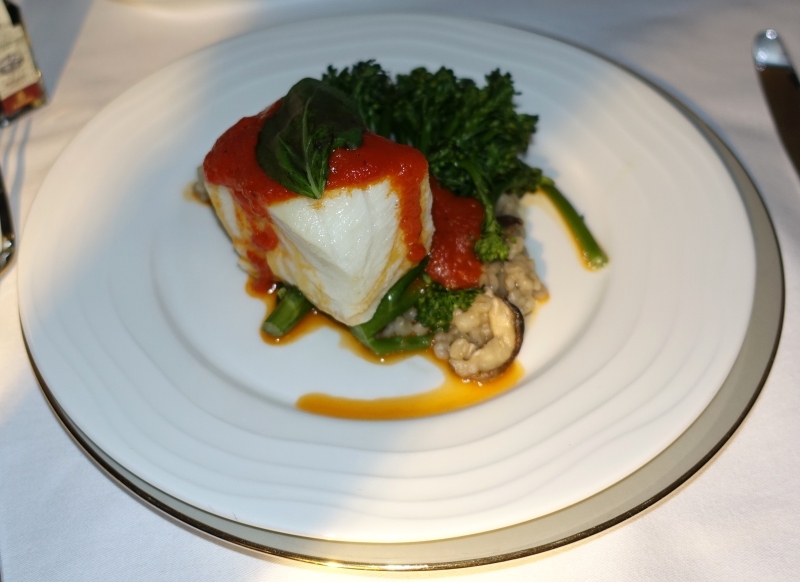 I was also impressed that the Sea Bass, which can so easily be overcooked and dry, was perfectly cooked and moist. 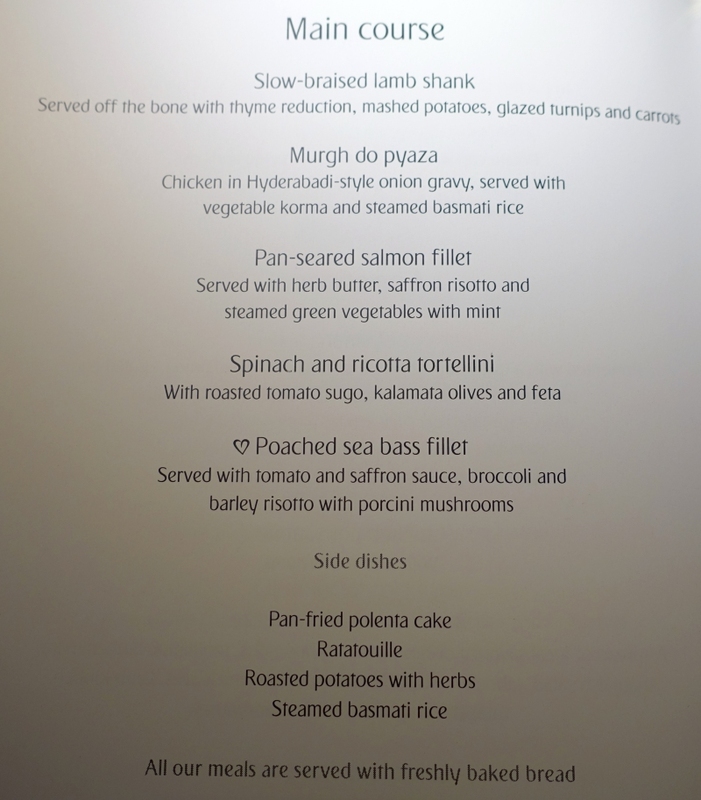 I personally wouldn't have accompanied such a delicate fish with saffron tomato sauce, but otherwise I enjoyed the dish. 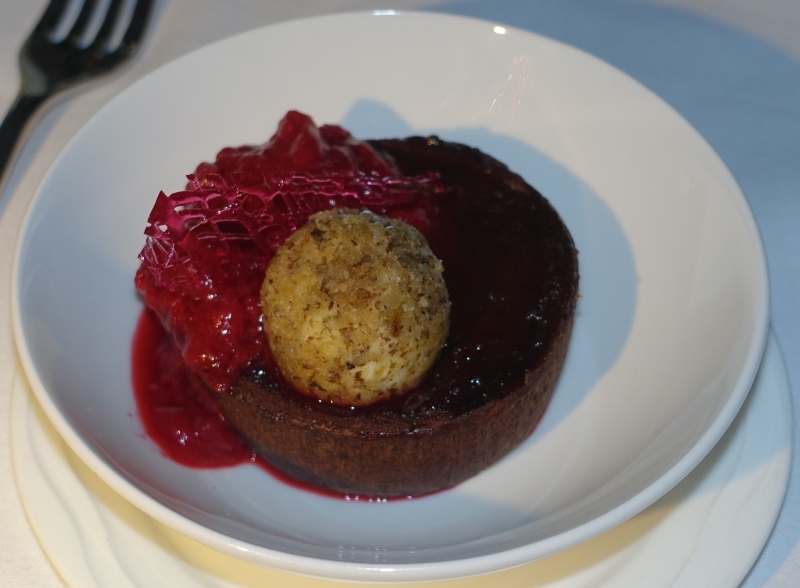 Readers know I'm a pretty harsh critic when it comes to desserts, and this Chocolate Cake was one of the best chocolate desserts I've had when flying, bested only by that Chef-made chocolate dessert in Etihad First Class a few years ago. 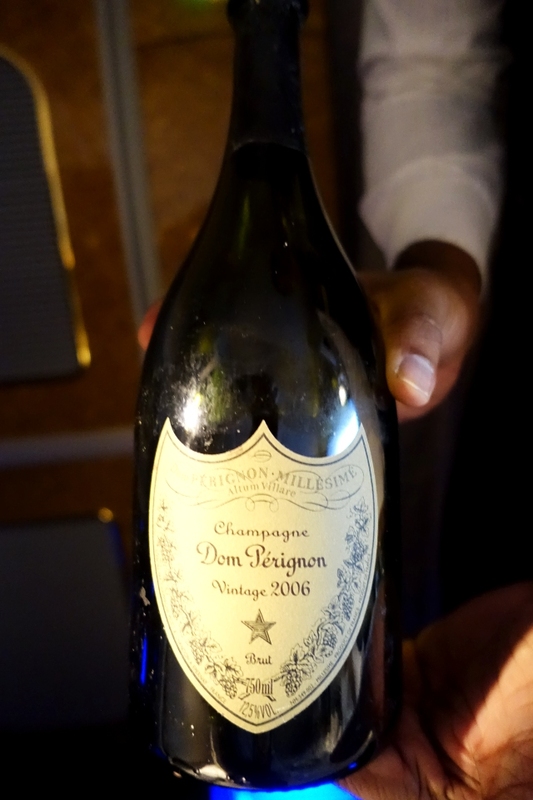 I asked one of the flight crew for turndown service for my son's bed as soon as I saw them moving about the cabin, and after I put my son to bed, asked for my bed to be turned down. The mattress pad is thicker than in Cathay Pacific First Class, but not as comfortable as in Singapore Suites or JAL First Class. 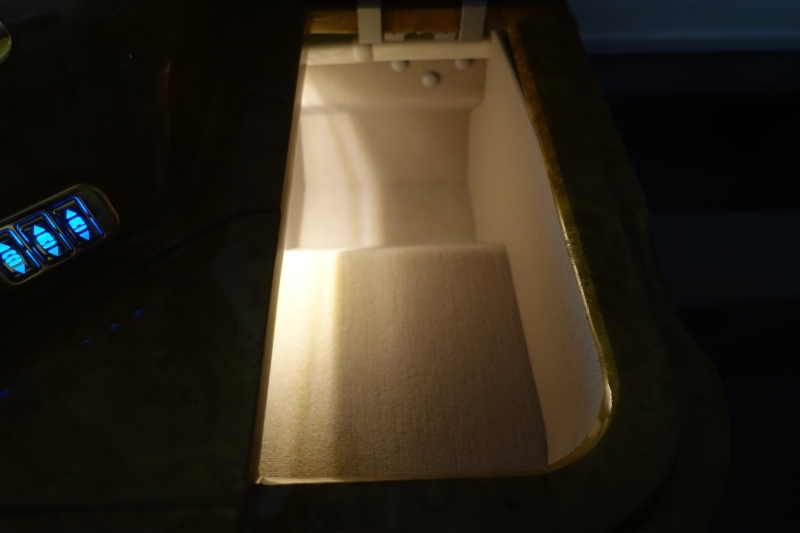 And as with American A321 transcon First Class, the leg part of the bed angles down slightly. Overall, with a sleep aid, I managed about 5 hours of sleep, which isn't bad, although I wish I could have slept more. 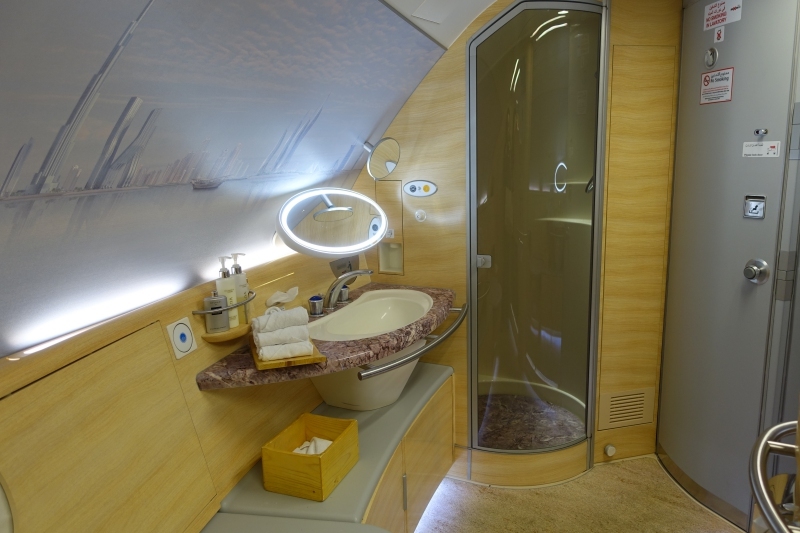 My favorite aspect of Emirates First Class is the spacious bathroom, with shower. There's something about a shower that is so refreshing on a long flight, and what I really appreciate is being able to get some moist air, since the cabin air is so dry. You're given 5 minutes of shower time, which is indicated by the dial, although I've never needed the full 5 minutes. 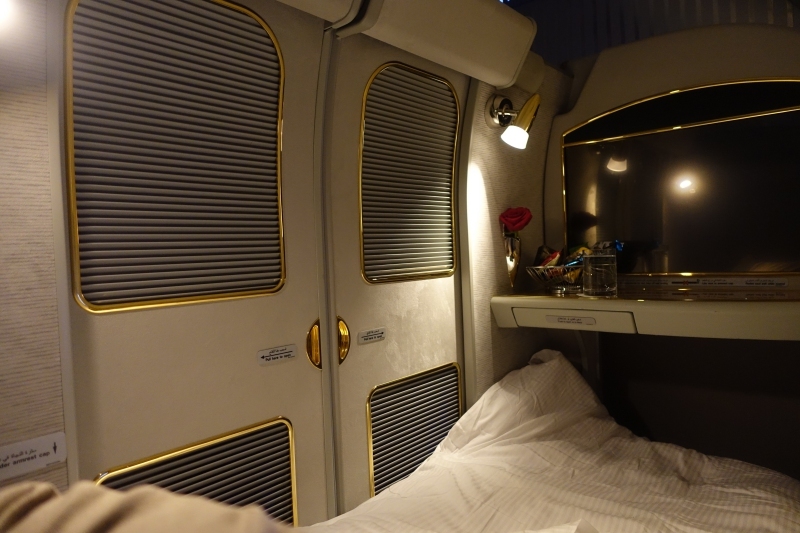 Emirates First Class on the A380 has a lot going for it–the best shower room in the sky, the privacy of a suite with closing doors, a nice amenity kit, and some of the better food I've had in First Class. 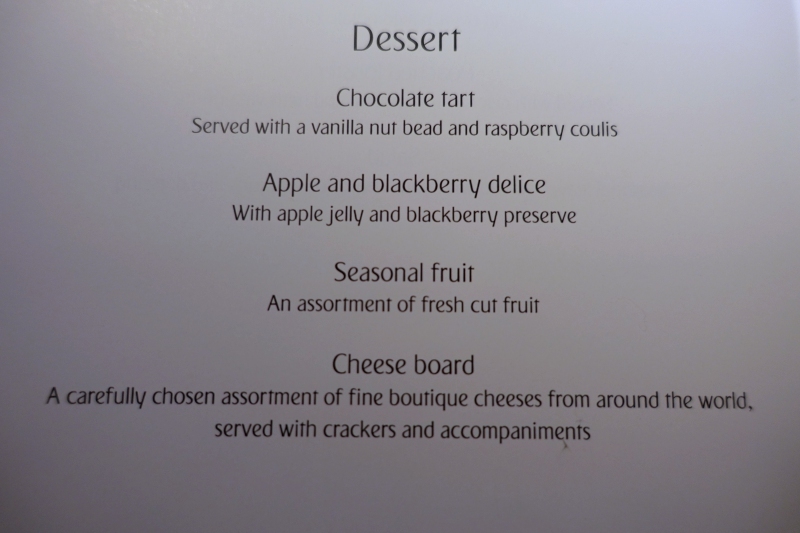 Service was good on this flight, although not as stellar as I've had in Singapore Suites, Singapore First Class, Lufthansa First Class, and Qantas First Class. 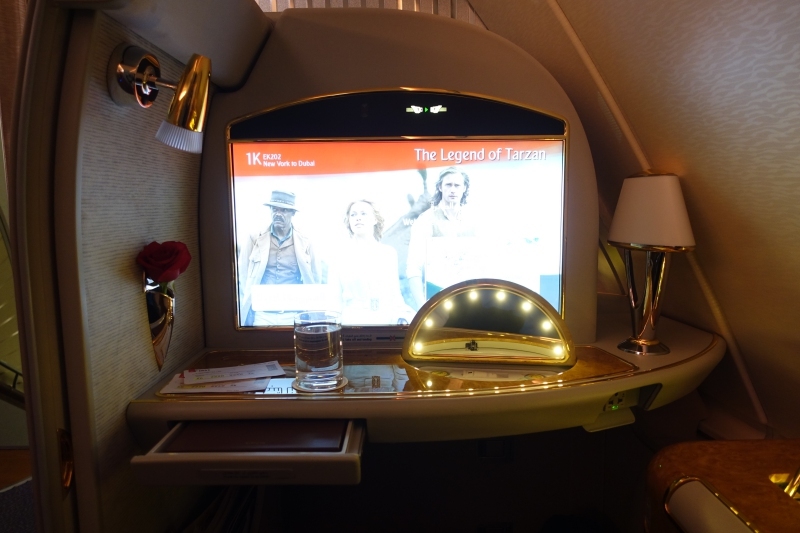 I personally would prefer a wider first class seat and one in which there's an ottoman so that you can dine across from a companion, as well as a more comfortable bed, as well as more understated decor, but that's personal preference. 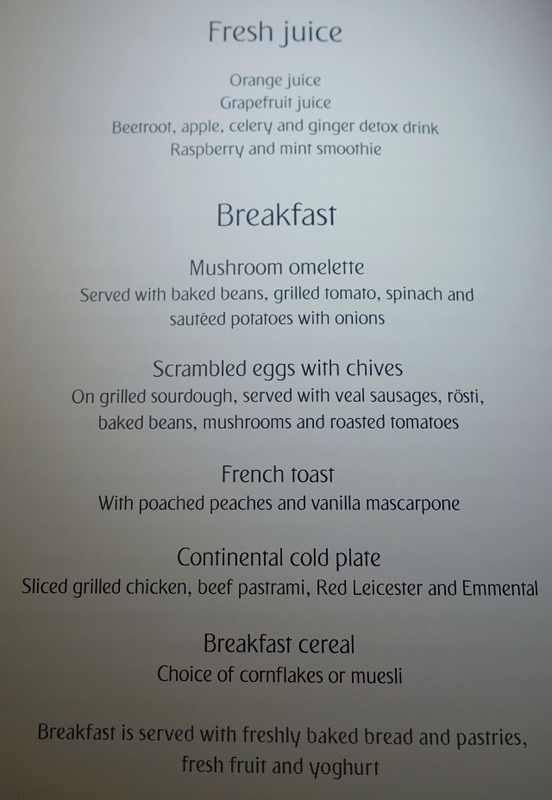 If you've flown Emirates First Class on the A380 recently, what was your experience?